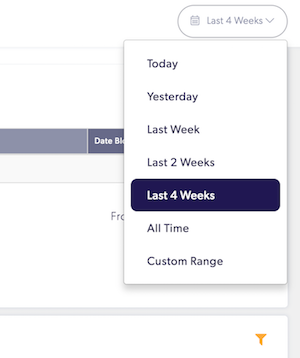 When creating your Custom Dashboards, you might want to take a look at your subscribers who have bounced email addresses, to add this component, go to Insights > New Dashboard or select a previously created Custom Dashboard > Add Component > Bounced Email Addresses. For more info on creating Custom Dashboards check out this link! The Bounced Email Addresses component details your subscribers whose servers rejected (or bounced) an email delivery from you - whether it was a newsletter or a dedicated email. Select the reporting period in the top-right corner of the card to choose a timeframe. Want this data in a separate spreadsheet? 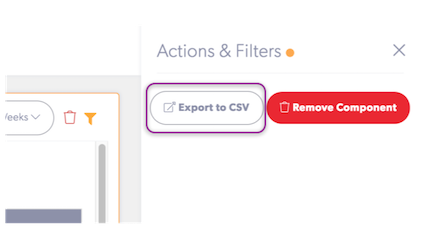 Easy, click the filter button to export the table to a CSV file.